Уместен вопрос: зачем делать проверку после последнего подпроцесса, если процесс так и так завершается. Ответ: затем, что это разные завершения - успешное и неуспешное. Нам полезно видеть это на схеме, а если схема исполняемая, то мы сможем получить статистику по проценту успешных и неуспешных завершений. 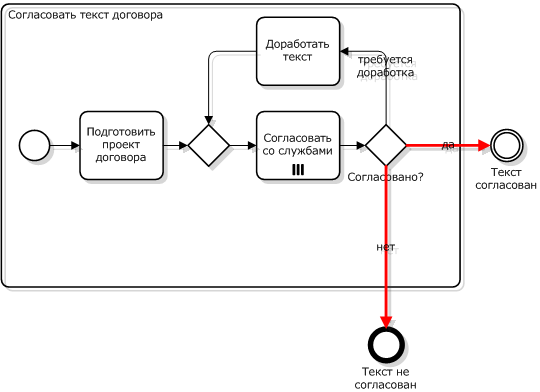 Кстати, мы только что ответили на часто задаваемый вопрос “как в BPMN моделируются вехи?”. Ответ: “пустыми” промежуточными событиями, как показано на рис.3. Как видим, проверка “текст согласован” производится дважды. Люди с программистким складом ума такие вещи не любят, справедливо указывая, что тут имеет место дублирование. Как избавиться от дублирования проверки? Сделать из подпроцесса два выхода, как на следующей диаграмме, нельзя. Это грубая ошибка: потоки управления в BPMN не имеют права пересекать границы подпроцесса. Если текст не согласован, подпроцесс инициирует событие типа “эскалация” (escalation), и управление передается на прикрепленный обработчик (attached event). Для моделирования подпроцессов используйте паттерны, изображенные на рис.2 или 9; какой именно использовать - дело вкуса. Диаграммы на рис.3 и 8 - модификации, в которые добавлены промежуточные события, моделирующие вехи процесса. Если ваш инструментарий поддерживает BPMN 2.0, то вместо ошибок в диаграммах на рис.8 и 9 используйте эскалации, как показано на рис.7. Excellent! I like the progression, and explaining the steps. I wish, however, that the “normal” routes did not have to be drawn differently than the “branching” routes. There are many cases where a person has a choice, and both choices are “normal” (and not so clearly exception). In that situation one will be forced to arbitrarily pick one route as “normal” and the other as exceptional. The “normal” route should have an event indicator on the edge of the activity as well. 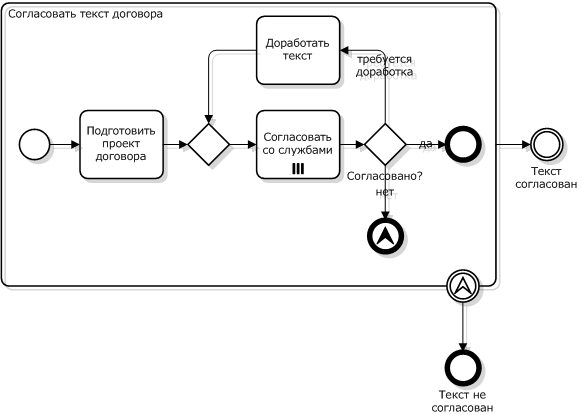 I realize this is not BPMN but maybe someday it will be….. The visual notation was pre-BPMN (obviously) but you can see that finally BPMN is getting to the point where we can start to actually represent subprocesses in this way. This is first published paper of linking subprocesses in this way. As for the “normal” routes, I’d rather call them “successful” or “desirable”. 1) Follow patterns depicted at figures 7, 8 and 9 if you want to outline a happy path (e.g. order approved vs. order declined). 2) Use patterns presented at figures 2 and 3 when branches are equally desirable (e.g. product order vs. services order). Keith, Are you kidding? I have been teaching this since 2007 as BPMN Method and Style. Anatoly, I agree with your post, but quibble on just 2 points. First, I think Error is preferred to Escalation, as Escalation is normally non-interrupting. Maybe you are using convention of interrupting Escalation for business exceptions and Error for technical exceptions? In that case, fine, but explain the convention. Second point, you should label the end events and boundary events (matching throw-catch labels) to make the meaning clearer from the diagram alone. But overall I am totally in agreement with your post! That’s right: I’m using Error for system abnormalities and Escalation for business exceptions. BTW, there is another difference between Error and Escalation: Error terminates all active threads i.e. behave like Terminate while Escalation affects a current thread only.Taking this into account, maybe it’s better to use Error for both cases. Thank you for point out the labelling issue. Technically one may leave a boundary event unlabelled to make it a catcher for any exception but the diagram at fig.6 is invalid: the escalation end event must have a code. I am unaware of the different termination behavior of interrupting Escalation vs Error. Is this in the spec? Can you provide reference? - Error. This type of End indicates that a named Error should be generated. All currently active threads in the particular Sub-Process are terminated as a result. - Escalation. This type of End indicates that an Escalation should be triggered. Other active threads are not affected by this and continue to be executed. Anatoly, everything is right. But only the page is 248 (BPMN 2.0 Jaunary 2011). There is a little question. You’ve wrote, that “All currently active threads in the particular Sub-Process are terminated as a result”. But why Sub-Process? I think that all threads in Pull are terminated, arn’t they? Thanks. To be precise, all threads in the given context are terminated. The context may be a top-level process (pool) or a subprocess. But if there is a subprocess S2 executed in parallel to the subprocess S1 that initiated an error then S2 won’t be immediately affected by the event. It may be affected though if the error was not catched by the subprocess S1 boundary event or event subprocess - if this is the case than the error will propagate to the upper level of subprocess or top process and hence terminate all child threads including S2. хотелось бы узнать как правильно создавать bpmn схемы , для потдверждения запросов и подобного? и еще вопрос возможны ли бесплатные консультации? Do you know why isn’t Bizagi modeler allowing me to add a catching interrupting boundary event of type Error to a sub-process? Of course it’s a bug. Interestingly, one may attach a catcher to task then convert the task into subprocess and it will work, more or less. Sure it does, use the context menu (right click). Version 2.6.0.4 of modeler only allows interrupting event subprocesses. Maybe you are talking about interrupting event subprocesses, those can be created. The non-interrupting can’t. Sorry I was wrong, didn’t get you right from the first time. Interrupting/non-interrupting mode should be set up by the interrupting/non-interrupting flag on start event of the event subprocess. But there is no start event in the palette. Seems that the damned thing is totally broken. I never needed event subprocesses, the attached event can always do the job. I also resorted to boundary non-interrupting event instead of event subprocess, I had no choice. But for my needs both approaches work well. Thanks!